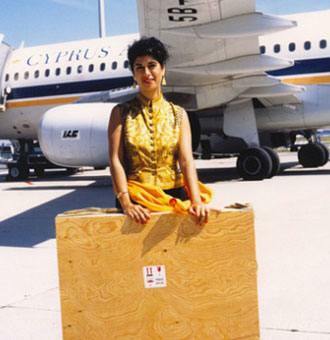 When Tasoula was nominated Honorary Consul of Cyprus to The Netherlands in 1987, art smugglers approached her to try to sell stolen artifacts back to Cyprus for large sums of money. This prompted Tasoula to make it her lifetime commitment to secure the repatriation of as many treasures as possible. In cooperation with the Greek Cypriot Orthodox Church, and with the personal support and inspiration of the late Archbishop Chrysostomos I, she embarked on an intense, and at times, treacherous process to secure their recovery. Much of her time was spent tracing the artifacts. Once traced, the challenge was then to retrieve and repatriate the artifacts. Through this process, she came into contact with a number of unscrupulous intermediaries in the trading of the icons, mosaics, and frescos. Given the large amounts of money associated with the trading of such artifacts, this exposed Tasoula to threats and opposition. She managed to secure the cooperation of a controversial Dutch art dealer, who knew the smugglers and the way they worked and managed to convince him to collaborate with the German and Cypriot police authorities. The detail of the events is vividly captured in her debut memoir ‘The Icon Hunter’ now on sale. Tasoula’s efforts took her far and wide, including the United Kingdom, Greece, Japan, and Germany. Her firm belief that destroying or hiding the cultural heritage of a people is tantamount to destroying their identity was the driving force behind her endeavors. Tasoula strongly asserts that respect for cultural diversity unites humanity. Tasoula’s career as a cultural activist has taken her into the underworld of art crime but also into embassies, courts, and parliaments to push for change. Her advocacy in the Netherlands led to the passage of a 2007 law that bans the import and ownership of cultural property originating from a territory that was occupied in armed conflict after 1959 and allows the government to seize any such property. In the U.K., Walk of Truth’s lobbying contributed to the passage of the Cultural Property (Armed Conflicts Bill) in 2017, legislation that ratifies the Hague Convention for the Protection of Cultural Property in the Event of Armed Conflict and its subsequent protocols. Despite her role in advocating tougher legislation to combat cultural heritage crime, her experience has taught Tasoula that courts of law are a last resort to settle disputes over looted cultural heritage. Litigation is time-consuming and costly. It is better by far to reach a mediated agreement with the current holder of looted art. She has often been surprised at people’s readiness to do the right thing and return something they may have bought in good faith, but know is not theirs by right to keep. We need tough laws to encourage best practice, but best practice can often be achieved without recourse to the law. 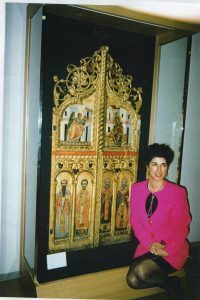 In late 1995, Tasoula discovered that the royal doors once located in the old church of Agios Anastasios in Peristerona, Famagusta were, now located at the Kanazawa College of Art in Osaka, Japan. With the backing of Archbishop Chrysostomos I, she travelled to Japan to try to persuade the college to relinquish the doors. She has also tried to take Cyprus’s claim to court in Japan. Her campaign has so far been unsuccessful, as the college argues it purchased them in good faith from a gallery in The Hague. “I am still hoping that the college will recognise that these doors belong to the people of Cyprus and will return them in recognition of international conventions, regardless of national law,” Tasoula says. These 16th-century icons portraying the saints John, Mark, Paul and Peter were looted from the Antiphonitis monastery in Kalograia near Kyrenia shortly after the Turkish invasion of Cyprus. An elderly Dutch couple living in Rotterdam purchased the icons from an Armenian door-to-door salesman. The couple, whose surname is Lans, planned to sell the icons and approached Christie’s International, which confirmed the provenance was Cypriot and urged them to check whether they were looted before consigning them to auction. The couple confided in their neighbour, the Greek consul general, who contacted Tasoula Hadjitofi. Tasoula arranged for Athanasios Papageorgiou, an expert in Byzantine art, to fly from Cyprus to the Netherlands to confirm the providence of the artifacts. Once he identified them as Cypriot, Tasoula received power of attorney from Archbishop Chrisostomos I to act worldwide on the church’s behalf for repatriations. Tasoula engaged Rob Polak of De Brauw and Blackstone, who previously represented Christie’s. Rob and Tasoula worked side-by-side on the case, with Rob advising Tasoula on the legislative changes required and Tasoula engaging in advocacy. Rob filed a civil lawsuit and simultaneously invoked the 1954 Hague Convention for the Protection of Cultural Heritage in the Event of War. Tasoula began lobbying members of the Dutch parliament in 1996 to ratify the treaty and amend their laws. Meanwhile, Rob and Tasoula fought the case in Dutch courts on behalf of the Church of Cyprus and UNESCO sent observers to the Netherlands. A district court ruled that the Church failed to prove the Lans couple purchased the icons in bad faith, which would have been necessary in order for it to claim title. The Court of Appeals found that the claim was time-barred under statutes of limitations in 2002. 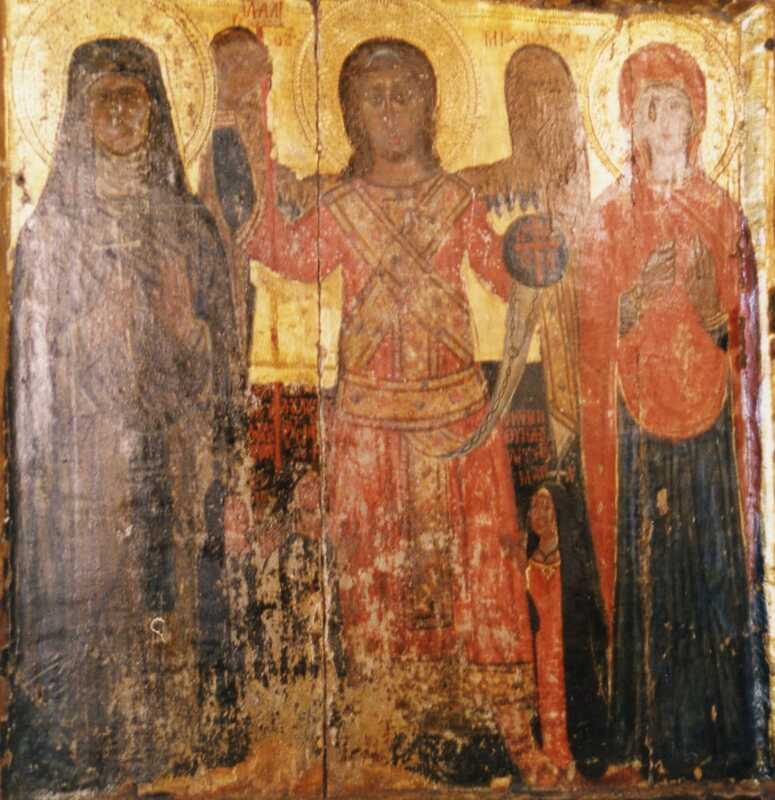 The four icons are now on display in the Byzantine Museum of Nicosia. This gesture by the Dutch government contributed greatly to Cypriot-Dutch relations, with Cypriot newspapers thanking the Netherlands for their return. Tasoula had learned in 1989 that a doctor living in Holland was in possession of the stolen Archangel Michael, but without a name and address, she was unable to investigate. Years later, she learned the doctor’s name from the Dutch journalist Jan Fred van Wijnen, who unwittingly revealed it to her during an interview. The icon belonged to the Church of St. John the Evangelist in Platanistassa. Although this Church is in the free area of Cyprus in Limassol, this particular icon was on loan to the Bishopric of Kyrenia in northern Cyprus in 1974. After Turkish troops occupied the region, the icon was looted and sold abroad. Tasoula tracked down the doctor and after she met him and his family, he willingly returned the icon to Cyprus without compensation and requested to remain anonymous. He had previously been confronted with blackmail threats from a black-market dealer who had threatened to reveal all to Tasoula. He was relieved to be free of this hold over him. Every Cypriot should be grateful to this doctor for his generosity. There are many victims of criminal networks like him, and it is important that they are given ways to step forward without fear. “Their information can help law enforcement convict the crooks,” Tasoula says. In September 1998, Tasoula received information that a fresco showing the head of the Archangel Michael, looted from the Antiphonitis Monastery, was in the possession of a Greek art collector in Athens. She contacted Marianna Latsi, who had purchased it in good faith. Latsi agreed to return it without compensation to the Church of Cyprus. Tasoula repatriated it to Cyprus in February 1999. “Collectors like Marianna Latsi must be praised for their sensitivity towards the people of Cyprus,” Tasoula says. Before Tasoula became the Church representative, the Church initiated a civil case against a private Greek collector in Athens to recover the Virgin Mary and Child icon looted from the church in the Antiphonitis Monastery in Kyrenia. The case dragged on for years with no success until Tasoula, with the Archbishop’s approval, visited the then Greek Minister of Culture, Evangelos Venizelos. Tasoula pointed out that under the terms of the Hague Convention for the Protection of Cultural Property in the Event of Armed Conflict of 1954, the icon should be returned to Cyprus. Her advice and the Minister’s efforts resulted in the icon being returned to Cyprus shortly thereafter. Venizelos’s decision was referenced in the Lans court case as a precedent for the Dutch to follow. The icon was brought back to Cyprus in September 1998 by Minister Venizelos and Tasoula. “This shows that international legal instruments are available if there is political will. In 1998 there was political will from Greece, but not from The Netherlands,” Tasoula says. Dating from 1584, the icon of John the Baptist was stolen from the church of Agia Paraskevi in the village of Mesa Potamos, Limassol. Although this village is in the free area of Cyprus, the icon was stolen while it was on loan to the Bishopric of Kyrenia in the occupied area for restoration just before the Turkish invasion of 1974. In 1986, it surfaced at the Diözesan museum in Freising. 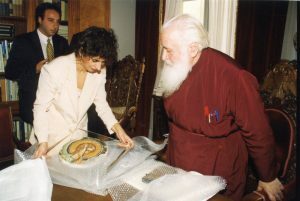 In 1999, Tasoula approached Dr. Peter Steiner, the director of the museum, with an authorisation letter from the Church of Cyprus and a letter from the then Archbishop, Chrysostomos I, addressed to the Cardinal of Bavaria requesting his support in petitioning the museum to return this icon to the people of Cyprus. Steiner understood the value of this icon to the people of Cyprus and cooperated in its repatriation. Tasoula returned this icon to Bishop Athanasios of Limassol, who gave it to the chapel in the village of Mesa Potamos where it was housed before 1974. “Religious leaders must endorse repatriations of sacred artefacts as a strategy, showing respect for each other’s religious freedoms. The intervention of the then cardinal of Bavaria was a true act of interfaith dialogue between Orthodox and Catholics,” Tasoula says. 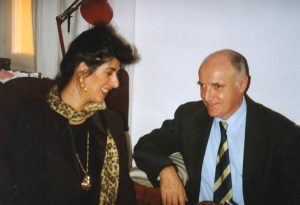 In 1997, a controversial Dutch art dealer Michel Van Rijn approached Tasoula with a proposal to lead her to a number of stolen Cypriot treasures hidden in Austria and Germany. With the support of the Archbishop, Tasoula planned a sting operation involving the Cypriot and German police authorities, art smugglers, the dealer Michel van Rijn and lawyers. Tasoula wanted to limit the church’s exposure so she instructed Van Rijn to “buy” a number of the artifacts with his own money. Once the artifacts were authenticated, Van Rijn would be reimbursed and she would discover who the sellers and art dealers were behind van Rijn’s offer. With the Archbishop’s backing, Van Rijn went on to purchase 32 frescoes and a Saint Thaddeus mosaic from the 6th-century Kanakaria church. Once Tasoula had evidence van Rijn was buying from a Turkish dealer named Aydin Dikmen, she contacted the Bavarian and Cypriot police, who prepared for the final buy to take place in Dikmen’s apartment in Munich. Seventy-five Bavarian police officers operating under cover arrested Dikmen and seized the contents of his apartments and storage rooms. This sting operation led to the seizure of one of the largest ever hauls of smuggled art from all over the world — over 5000 pieces, some 350 of which were of Cypriot origin. After a long and costly court fight to claim back the Cypriot objects, 173 items were returned to Cyprus in 2013, including a mosaic depicting St. Thomas hacked from the walls of the Kanakaria church. All the frescoes, icons, and two mosaics are now housed in the Byzantine Museum in Nicosia, Cyprus. The intricacies of the Munich Case are described in depth in Tasoula’s book, The Icon Hunter, published on April 11, 2017. Tasoula spotted this fragment of a fresco in the sales catalogue of an auction house in Cologne in September 2012. Dr. Athanasios Papageorgiou, the former director of the Department of Antiquities, identified the fresco as looted from the Antiphonitis church. Tasoula obtained power of attorney from the Bishop of Kyrenia to rescue the relic. Tasoula asked for the fragment to be withdrawn from the auction and contacted the consigners. They immediately agreed to return the fragment to Cyprus. The Bishop of Kyrenia flew to Holland to collect it and he returned it to the Church of Cyprus in a ceremony in Nicosia in December 2012. “During this ceremony, the Bishop and Mayor of Kyrenia referred to me as ‘The Icon Hunter,’ and this was the inspiration behind my book’s title,” Tasoula says. A Canadian collector unwittingly purchased four frescoes looted from Cyprus. Two were plundered from the Monastery of Panagia Apsithiotissa in Kyrenia – the other two are Cypriot, but their origin could not be determined. Tasoula approached the Canadian possessor in May 2014 and convinced him to return them without compensation. He FedExed them to her hotel room in London. They arrived — unexamined by customs.The frescoes had been removed with force when they were looted and were badly damaged. Tasoula had them restored and they are awaiting repatriation. The frescoes had been removed with force when they were looted and were badly damaged. Tasoula had them restored and they are awaiting repatriation. These frescoes were exhibited at the House of Lords in December 2014 as examples of looted and trafficked sacred heritage. Under the auspices of Baroness Berridge, Walk of Truth organised an expert event called Blood, Treasure and Islamic State: War, Extremism and the Looting of Culture. This event became the catalyst for the subsequent legislative changes in the UK in relation to cultural heritage. MP David Burrowes of Ensfield championed the creation of the All Party Parliamentary Group for the protection of cultural heritage which was inaugurated by the then Mayor, Boris Johnson in September 2015. The APPG, is now co-chaired by David Burrowes and Lord Renfrew, who is authority in this field. Walk of Truth holds the secretarial of this committee and Tasoula is a key advisor. The Icon Hunter’s work continues to this day. We global citizens need to play our part in respecting and protecting our global heritage. Support our cause by contributing to our crowdfunding campaign and get a copy of The Icon Hunter.